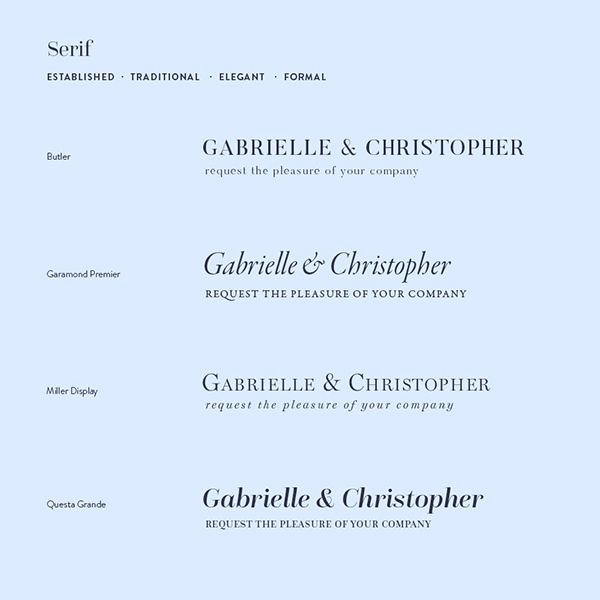 Fonts and Typography – know your Serif from your Sans Serif! The choice of font and how this is laid out within your invitation is just as important as the design, in not only contributing towards the overall impact, but also reflecting the tone of wording you have opted for. Typography is something Cutture will take care of as part of the overall design with you, however it’s really helpful for you to understand a little more about font choices and why they are important as part of your design journey with us. Font and typography is the second most important area of your invitation design, font choices really do make or break a design! Fonts are really interesting, they are the soul of a design, they add the communication, not only by the words they are delivering but your personality shines through them. 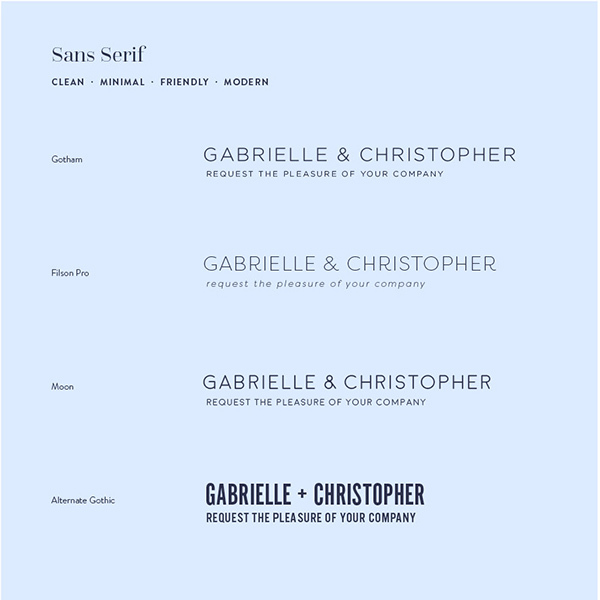 Your choice of font is very personal, it creates a light/ happy/ style saavy/ traditional tone, by simply changing a font you can change the entire design. It’s then all about the layout as well, how fonts and typography is laid out is quite an art and this is one area where your investment in a professional designer really pays off. 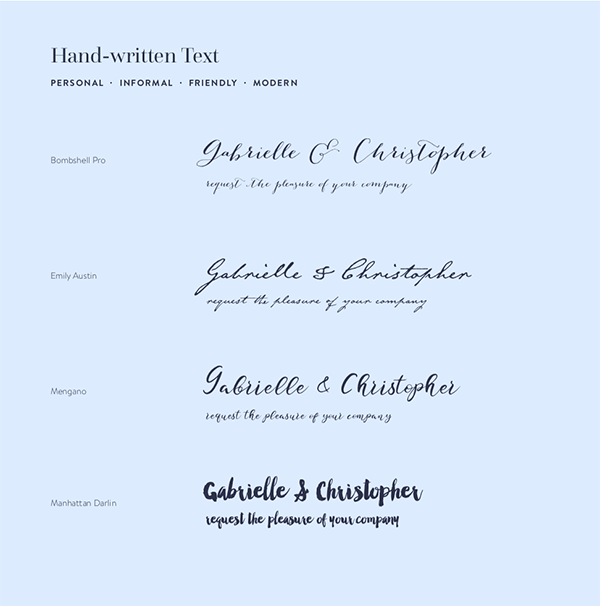 We’ve found the best way to try to narrow down fonts is to try to think of the feelings/words you would like your invitations to convey when your guests receive them. A selection of words really helps us in designing and choosing the typography for your design, we can then use the right style of font to match both the format and the messaging. We rarely ever use just one font styling in our designs, and contrasting font styles are often the perfect match. 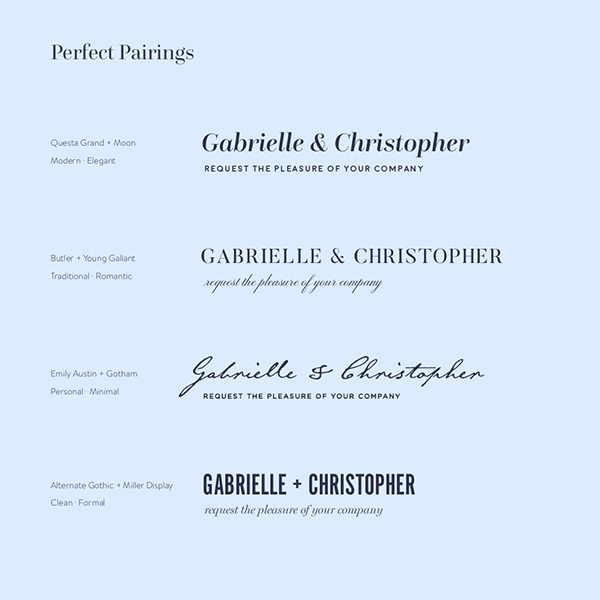 We’ve made a few examples of paired fonts to show not only how they compliment each other, but that there’s a perfect variation for every occasion! Don’t worry if this is all getting a little overwhelming, usually our team of designers do all the hard work of choosing for you. All we really need are just a couple of keywords to describe your theme and we can take it from there. Take a look at some of our wedding invitations from the past where you can see how font pairings and typography are worked into designs, sometimes you have to be quite inventive! One reason why we ask for all of your copy (wording) to be sent over at the same time is so that we can design meticulously for the amount of wording you have. In addition to the invitation, you will have separate information cards informing your guests of all the practical details, it’s really good to know early on as possible how much wording there will be as it plays a huge part of the overall format of the design. It’s a good idea to spreadsheet all the details first from invitation wording to accommodation details/transport details to the RSVP wording, before getting creative with the actual writing of the words – Don’t forget our recent guide ‘wording your invitations in a voice of your own’ to help you! Just remember, we have to fit every word on perfectly, so too many changes actually takes a designer a fair amount of time tweaking words and even letters to make sure they fit in, so do be sure that when you send your final wording over it’s as close to final as it can be to make any copy changes easier and therefore quicker for your designer! You may hear your designer talking about serifs, don’t worry it is not complicated and simply and aesthetic choice! A serif is a slight decorative ‘flick’ on a letter as part of a font family, they come in many different forms and they can really change the look and feel of your overall design. Your font choices really are the thing that communicates whether it’s a formal, informal, contemporary or traditional style of wedding. Sans serif is simply ‘without’ the flick therefore leaving very clean, contemporary letters, simple and no fuss. Again your designer will take you through the process and show you options that technically and aesthetically work so you don’t have to trawl through the thousands of fonts on offer as it can be quite a minefield! 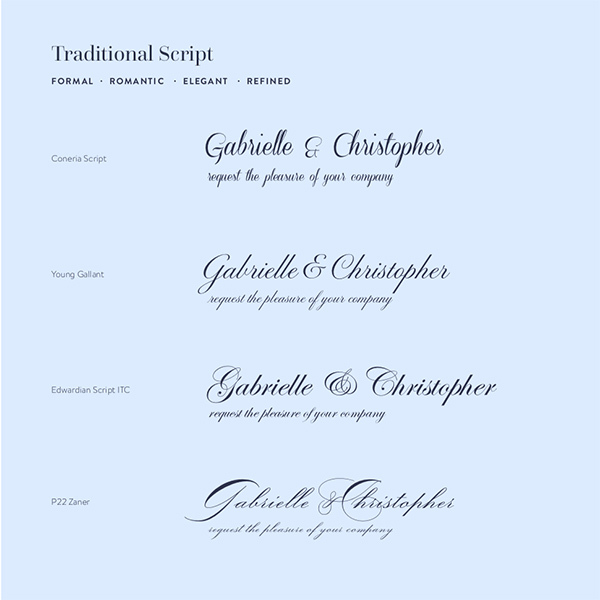 Hopefully, you have found this short insight a little bit useful for when you are choosing your wedding invitation fonts, if however, you find yourself with a new passion for fonts, we highly recommend the great book ‘Just my Type’ by Simon Garfield for further reading!